US domestic soybean production for 2018-19 was projected to rise another 107 million bushels to 4.693 billion on increased yield numbers, Department of Agriculture data showed last week. World soybean production increased 2.22 million mt, with estimated larger crops for the US outpacing decreased projections for total foreign production. Global soybean export projections for 2018-19 were reduced 1.06 million mt to 156.9 million mt. 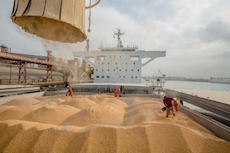 China's 2018-19 soybean imports were reduced 1 million mt to 94 million mt, according to the USDA.